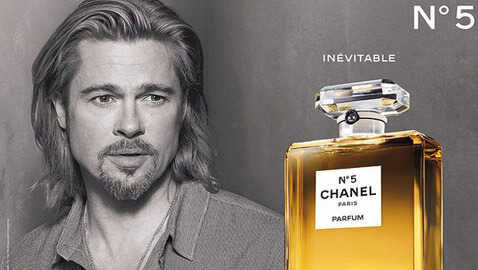 On Monday, Brad Pitt made his debut as Chanel’s No. 5 perfume, becoming the first male face of the iconic fragrance. Pitt is seen dressed casually and wearing long hair. He looks pensively at the camera, while a black and white video plays in the background. According to Women’s Wear Daily, out of a total ad campaign budget of $10 million, Pitt’s pay was $7 million. With this debut, Brad Pitt joins the likes of Audrey Tatou, Nicole Kidman, and Catherine Deneuve. After all, it was long time due – there are few males who wouldn’t like to be associated with the only thing Marilyn Monroe wore when going to bed. The ad has drawn mixed reviews on the Internet, with the responses mostly being positive, while some did think the ad to be strange.